Today, I'd like to talk about picking a good Pokémon Card gift for the trainer in your life. It can be a daunting task shopping for Pokémon cards, especially if you're not very familiar with the game. Here are some quick tips to help. Pokemon have many different elemental types like Water, Fire, Grass, Electric. Usually players, and especially beginners, tend to focus on a few certain types. Just by looking at some of their favorite cards you can often tell what type of Pokémon they like. Pokemon fans undoubtedly have a few select favorite Pokémon too. My personal favorite include Mew, Flareon, Chansey and Eevee. Often the accessories and gift boxes will feature certain Pokémon, so those accessories can be a good bet. There are two basic ways to buy cards, which go back to the very beginning of the game almost 20 years ago, and they are Booster Packs and Decks. A deck, or preconstructed theme deck, is a pre-built, competition legal, 60-card deck of Pokemon cards. Decks are cool because they often include a coin, rules, instructions, and everything necessary to play the game. 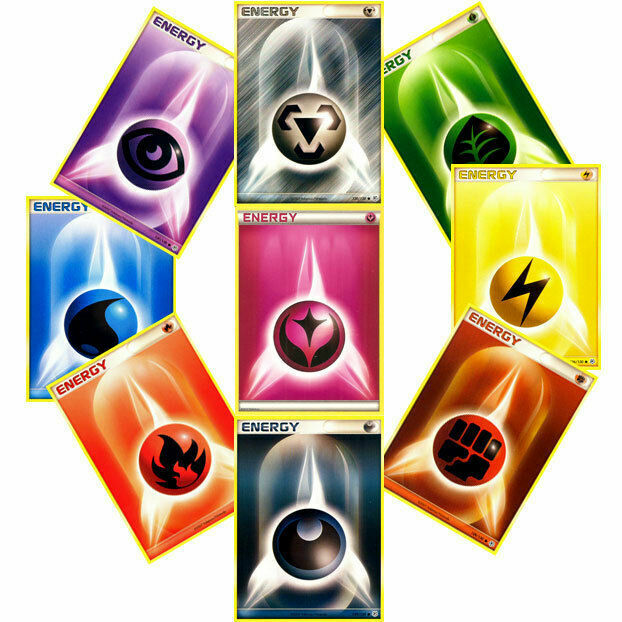 Decks also contain a bunch of Energy cards, like the ones shown above. Decks are fun for kids and beginners who want to play the game, and not just collect, but aren't advnaced enough to build their own deck yet. Many advanced players prefer booster packs because you never know what you're going to get. A booster pack is just 10 psuedo-random cards. Boosters always include a number of common cards, a couple uncommon cards, and a one or two Rare or Super Rare cards. Booster packs are a great small gift for a more advanced player, or a collector. Most gift boxes contain one or two booster packs. Pokemon Booster packs are usually about $3 or $4 for current sets that are still in print. Pokemon Card Tins - There are a number of cool tins and metal lunch boxes which can be a great way to get a couple extra packs, and can double as fun storage later. Binders - Binders are another great gift idea because they're helpful for players who collect and players who play the card game. Pokemon TCG players use binders to store and protect their cards, and often to make it easier to go through their collection and pick out cards when building a deck. There are a bunch of Pokemon Binders available now-a-days with pages that are bound into them. I hope this was helpful! Gotta catch 'em all! Our Roaring Skies Boosters and Theme Decks have arrived and are ready to ship for their May 6th Launch! Place your orders now!